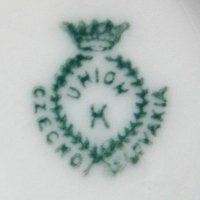 This page does not deal with a specific manufacturer but rather explains the background of a certain mark type named after an interest group. All members of that group used one of two specific marks, meaning that mark attribution of certain variants towards a specific manufacturer is impossible. You may have noticed that Oskar Vielgut was mentioned twice above, each time together with a different partner. Reason was that he merely acted as active investor in both cases, leaving operations to the corresponding business partner. Both factories funded by him were previously not related as can be seen on their respective factory history pages. While the companies in Meretitz near Klösterle used the wreath mark including "UNION" and a "K" (for "Klösterle") the factory of Ernst Wahliss used the same basic mark with a "T" (for "Turn-Teplitz"). As the association was membership-funded (unlike the EPIAG) and only consisted of a few smaller companies it never was able to generate enough weight in form of an influencial business position and thus already in 1927 merged into its former main competitor, the EPIAG group. 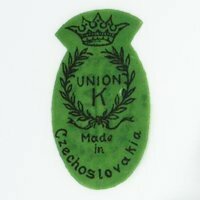 All mark types can be found with either the short and plain 'Czecho-Slovakia' or the much longer 'Made in Czecho-Slovakia', but the different wording has no relevance whatsoever. Really interesting is the obvious use of the hyphened version long after it had actually been branded illegal under the US McKinley Tariff Act. On the other hand, the UNION had registered their marks including the country of origin additions; altering those would have required a new mark registration. This may perhaps have resulted in an exception from the rule. It is no secret that the association not only produced items but also re-decorated certain goods. Sometimes the black-on-green ⇒cover-up mark barely hides the original manufacturer mark used by the direct competitor. I have included an example of the EPIAG mark of former Oscar & Edgar Gutherz below. Author Robert Roentgen sometimes incorrectly claimed that the "T" stood for "Thun", probably believing that it resulted from the fact that the father of the Vernier brothers formerly worked for the Gräflich Thun'sche Porzellanfabrik in Klösterle. 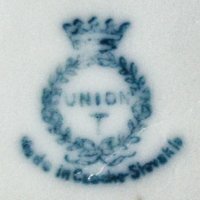 Used around 1921 until 1927, version without an initial but with 'MADE IN CZECHO-SLOVAKIA'. 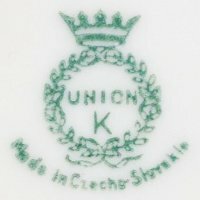 Used around 1921 until 1927, version with 'K' and 'MADE IN CZECHO-SLOVAKIA'. 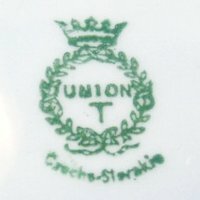 Used around 1921 until 1927, version with 'T' and 'CZECHO-SLOVAKIA'. 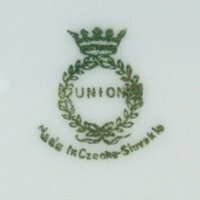 Used around 1921 until 1927, version with 'T' and 'MADE IN CZECHO-SLOVAKIA'. Used around 1921 until 1927, cover-up hiding the EPIAG mark from the O.&E. Gutherz factory in Altrohlau. Used around 1921 until 1927, slightly different version with 'K'.